Race issues on college campuses have seemed to prevail over time with disregard to the humans who are deeply impacted by it, the students. Students at the UCLA School of Law recently released a video titled, 33 depicting their perspectives on being such a small population of black students enrolled in the school. Their mission is "to raise awareness of the disturbing emotional toll placed upon students of color due to their alarmingly low representation within the student body." In school, I too remember occurrences of feeling singled out by my peers solely due to my race. Some may think that I was simply pulling the "race card," however I was only showing "my reality card." It's the true reality that so many minority students face on their respective campuses. This is also true for an underrepresented group of individuals at Harvard. This has led a group of students to raise their voice on the same issue on campus, race. By doing so, "I,Too, Am Harvard" has since been born. It was curated by sophomore Kimiko Matsuda-Lawrence after she developed a play with the same concept. The production portrays the experiences of being a black student at Harvard. "The play chronicles a range of challenges faced in the black community through unaltered excerpts from over forty interviews with Harvard students." "This idea developed in light of recent debates surrounding the issue of affirmative action on this campus. When interviewing black students for the project, I didn't even have to ask about the affirmative action article written in fall of 2012 which triggered this debate, yet it came up in every single interview. This project is our way of speaking back, of claiming this campus, of standing up to say: We are here. This place is ours. We, TOO, are Harvard", said Kimiko Matsuda-Lawrence. Not only are the students spreading awareness with the play they have joined together and launched a social media photo campaign with the same title that has been making it's rounds online. 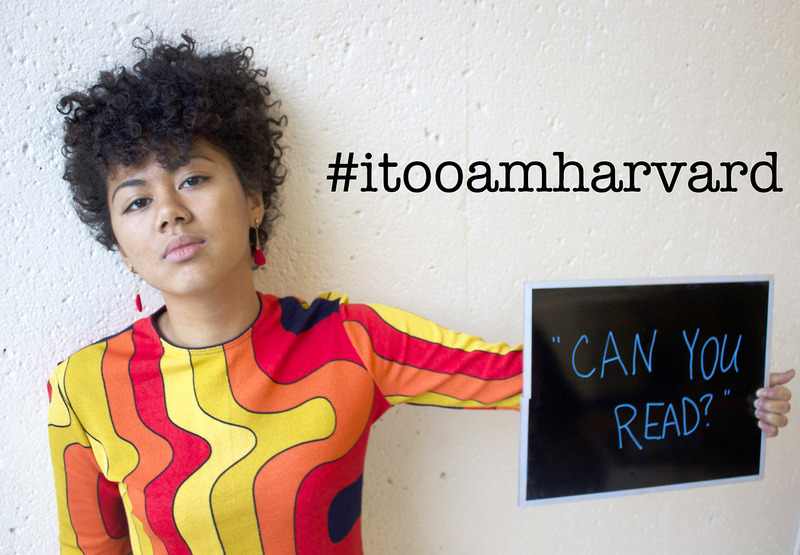 As stated on their Tumblr page, "the photo campaign highlighting the faces and voices of black students at Harvard College. Our voices often go unheard on this campus, our experiences are devalued, our presence is questioned -- this project is our way of speaking back, of claiming this campus, of standing up to say: We are here. This place is ours. We, TOO, are Harvard." As of now, their Facebook page has received more than 1,200 likes and the Tumblr has received thousands of hits. The play will debut Friday March 7th at Lowell Lecture Hall at 7 p.m. as a part of the 16th Annual Black Arts Festival Weekend as presented by the Kuumba Singers of Harvard College.